The research used data and analysis from comScore Social Essentials™, comScore AdEffx™ and Facebook’s internal analytics platform. It focused on the impact of branded earned and paid media exposure on the behavior of Facebook Fans and Friends of Fans. Brands can maximize social marketing programs by leveraging framework to move beyond Fan acquisition, to delivering reach, impact, and measurable ROI by using the Brand Page as a control panel and focusing on optimizing broader marketing objectives: Fan Reach (exposure in the news feed), Engagement (fans interacting with brand page marketing content), and Amplification (viral delivery of marketing content form Fans to Friends of Fans). Most leading brands on Facebook achieve a monthly Amplification Ratio of between 0.5 and 2.0, meaning that they extend the reach of their earned media exposure of Fans to Friends of Fans by 50-200%. These ratios can be increased to improve brand reach by focusing on tactics to optimize Fan Reach and Engagement or by supplementing with paid advertising strategies. Concentrated social media campaigns, such as those performed during important marketing promotions, can significantly amplify the reach of earned media exposure. Such amplification may drive increased awareness and consideration that is manifested through higher brand purchase behavior among exposed Fans and Friends of Fans. One example cited in the report was Skittles candy. 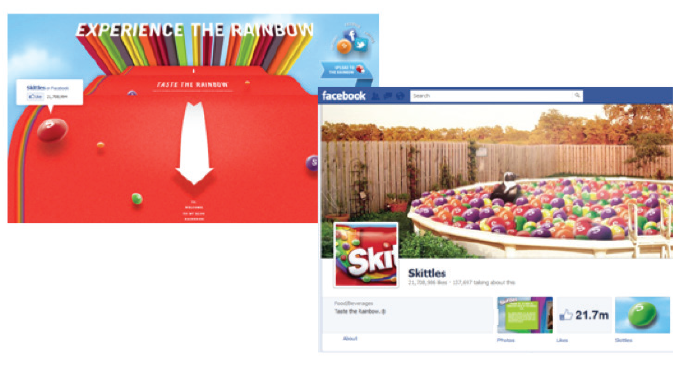 While the Skittles Web site (www.skittles.com) attracted an estimated 23,000 unique visitors in March 2012, the Skittle Brand Page on Facebook (www.facebook.com/skittles) attracted 14 times as many unique visitors, generating 320,000 visitors in the same time period. The best use of social marketing and Facebook is still evolving, but its reach to consumers cannot be denied. Facebook does engage its users, and consumers, accounting for an estimated one of every seven minutes that users spend online. Instructor can download the report from comScore at http://www.comscore.com/Press_Events/Presentations_Whitepapers/2012/The_Power_of_Like_2-How_Social_Marketing_Works (requires registration, but is quick and provides immediate access to report). Divide students into groups and have each group download the report and summarize a section to present to the class. Discuss the implications of this research for marketing on Facebook and other social media. 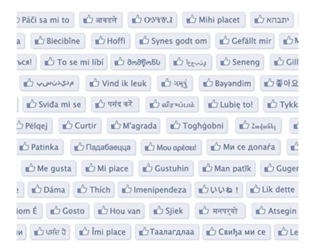 What companies and industries would find Facebook the most beneficial to use in promotion? Why? In groups: Have students examine a product or company of their choice on Facebook. Have them do a quick analysis of the product: target market, product, pricing, channel, promotion, etc. What is the company doing right and wrong? In groups: Have students develop a revised social media marketing plan for the product they just analyzed.